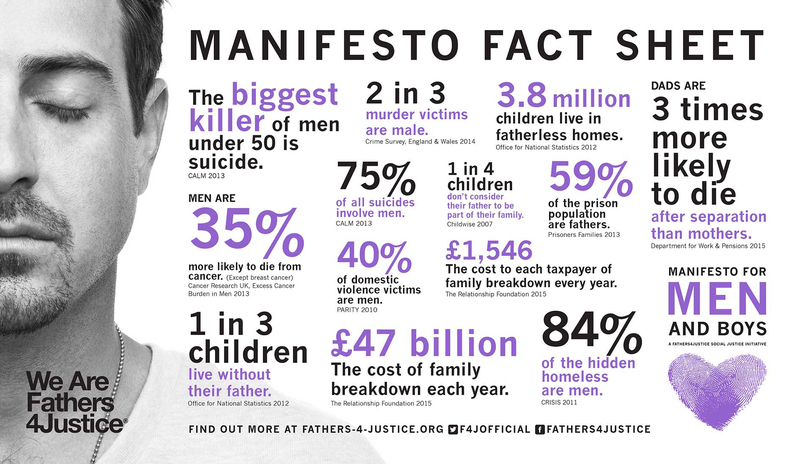 The key facts about family breakdown and fatherlessness in the UK. lose contact with their fathers every day in secret courts. children live without their father. Nearly 4 million children are fatherless in the UK. is the cost of family breakdown every year. Our rights as parents to family life have been repeatedly beached in the UK courts. The role of government should be to protect families. Instead it has been instrumental in breaking them up. Article 16, Universal Declaration of Human Rights. (1) Men and women of full age, without any limitation due to race, nationality or religion, have the right to marry and to found a family. They are entitled to equal rights as to marriage, during marriage and at its dissolution. (2) Marriage shall be entered into only with the free and full consent of the intending spouses. (3) The family is the natural and fundamental group unit of society and is entitled to protection by society and the State. Article 8, European Convention on Human Rights. Right to respect for private and family life. Everyone has the right to respect for his private and family life, his home and his correspondence. Successive governments have deliberately removed the need for a father legally, emotionally and biologically through legislation. We now have a generation of socially engineered fatherless families. After the death penalty, the removal of children from their parents is the most draconian action the state can take. The 1989 Children Act abolished “The rule of law that a father is the natural guardian of his legitimate child” and replaced the “archaic” concept of guardianship with a loosely defined collection of rights under “parental responsibility”. PR was awarded automatically to mothers, but fathers only acquired it dependent on their relationship with the mother. Fathers have no legal right in law to see their children. The Government states that ‘it does not believe that a legal presumption to contact would be helpful’. This position was reiterated again in 2001 by the Chairman of the Family Justice Review whose conclusion was that fathers have no rights and should have no rights. Family Justice Review, 2011. Fathers only have a right to apply to a court to see their children after separation. Fathers have been denied a legal presumption to ‘shared’ or ‘equal’ parenting which would ensure they had the same rights as mothers. A father’s only legal responsibility is to provide financial support for their children, not emotional. In 2008 The Labour Government introduced the Human Fertilisation and Embryology Act which removed the ‘need for a father’ and changed it to the need for ‘supportive parenting’. There is more legislation protecting animals, than there is protecting fathers. 50% of children will have seen their parents divorce by the time they are 16 (Benson, 2010). One child in four doesn’t consider his father to be part of his family (Childwise, 2007). 3.8 million are living ‘at the mercy of family courts’. (Sir Paul Coleridge, Daily Mail, 14/7/11). 70% of young offenders come from lone-parent families (Youth Justice Board, 2002). Half of all secondary school pupils have broken the law (Beinart, Anderson, Lee, & Utting, 2002). One in four secondary school pupils now has a criminal record (Donnellan, 2004). Britain has the highest level of self-harming in Europe (McLoughlin, 2006). The UK has the highest proportion of children living in workless households in Europe (G., J., & P., 2005). The teenage pregnancy rate in the UK is the highest in the developed world and 4 times higher than the West European average (Allen, Dowling, & Rolfe, 1998). Half of these pregnancies end in abortion; in 2010 in England and Wales there were 34,633 conceptions amongst girls under the age of 18, of which 49.9% ended in abortion (Office for National Statistics, 2012). The other half results in by far the highest rate of single motherhood in Europe. 93.1% of broken families are headed by a single mother (Office for National Statistics, 2012). 40% of mothers admit to obstructing contact (Department for Social Security, 1998). Our government, children services and family justice system have a history of failing our most vulnerable. From Victoria Climbie to Baby Peter Connolly whose father was denied access to him on the basis of false allegations, the Dickensian treatment of children continues unchecked. Child welfare professionals claim to ‘act in the child’s best interests’ despite having kept no records on the outcome for the children they have been responsible for. The result has been an explosion in anti-social behaviour, gang culture and children having children on the streets of our country. The courts claim to act in the ‘child’s best interests’ yet have kept no records on the outcomes for children to support this claim. Britain has the highest rate of young offending Western Europe. (Mori/Youth Justice Board, 2002). The cost of youth offending is £13 billion every year. (Home Office, 2000). Britain jails more children than any other country in Western Europe. 1 in 4 teenagers have a criminal record. (Donnellan, 2004). The UK has the highest rate of teenage pregnancy in the developed world; 4 times higher than the West European average (Allen, Dowling, & Rolfe, 1998). In February 2007 the United Nations Children’s Fund (UNICEF) produced a report entitled Child poverty in perspective: an overview of child well-being in rich countries (Innocenti Research Centre, 2007). The report analysed 40 indicators of child well-being in 21 developed countries for the years 2000 to 2003. The Netherlands came top of the league, followed by Sweden, Denmark and Finland. The United Kingdom came bottom. The cost of mass fatherlessness and the ensuing social consequences are catastrophic for our country socially and economically. Family breakdown drives families into grinding poverty with the worst possible outcomes for our children. The direct cost of family breakdown to the UK economy has been estimated at £44 billion a year or £1,470 per taxpayer (Relationships Foundation, 2012). This is economic black hole is larger than the entire annual defence budget for the UK. In 2004, the Family Justice System cost the taxpayer £435 million. In 2011, the Family Justice System cost the taxpayer £800 million. The cost of state benefits for single parent families is £6 billion. (Dept Work & Pensions). An ideologically driven industry has been built around the separation of children from their parents. The family justice system is predicated on maximum conflict and minimum resolution. Courts are for criminals, not families, yet they remain impermeable to reason or change of the system for the benefit of families and most importantly children. The public can have no confidence whatsoever in the operations of secret family courts which are above scrutiny and transparency. Since the introduction of the court order in 1989 the Family Courts have issued well over a million orders for contact. They did this blindfolded as no records have ever been kept on the outcomes for children affected by those orders. Between 75% and 86% of these followed applications from fathers (Hunt & Roberts, 2004), and fathers make up an astonishing 97% of so-called “non-resident parents” (Kielty, 2006). Most contact orders are obstructed to some degree; a study by the Department of Social Security showed that 40% of mothers admit to obstructing contact (Department for Social Security, 1998). A 2009 study by lawyers Mishcon de Reya revealed that half of parents deliberately spin out proceedings (Mishcon de Reya, 2009). The courts do little to prevent this: contact orders are not monitored for compliance or efficacy, and fewer than 2% of resident parents defaulting on contact orders face any consequence (Hansard, 2006). When contact does not happen the onus is on the applicant to prove to the criminal standard that the other parent is obstructing it, and not on that parent to explain why contact ordered is not taking place. In 2004 Lord Filkin, Minister for the Family Courts, voiced what thousands thought, “Any court that does not enforce its own orders is a sham”. Sir Paul Coleridge said in 2010 that ‘if an order is disobeyed, say, three times the residence of the child should nromally be transferred to the other parent.’ This has been F4J’s position as outlined in our Blueprint since 2004. One study found contact decreases over time and breaks down entirely in over 20% of cases within 5 years (Simpson, McCarthy, & Walker, 1995). This has been confirmed by other studies (Bradshaw, Stimson, Skinner, & Williams, 1999) (Peacey & Hunt, 2008). 40% of children will lose contact their fathers within 2 years (Bradshaw & Millar, 1991) to 60% overall (Butler-Sloss, 2003). 93% of sole residence awards are made to mothers on the basis of gender, and up to 97% of excluded “absent” parents are fathers (Kielty, 2006). If, as the courts claim, the rights of the child were paramount, then they would have kept records on the outcomes for the children to understand whether their best interests were being served by the court process. In 2003 a Parliamentary Inquiry said this on the issue of court records, “In the absence of data, the identification of what might be best for any particular child in any particular case is fraught with difficulty”. “Every child has thereby become ‘the subject of an uncontrolled experiment”. Mike Stein, Co-director of the Social Work Research and Development Unit at the University of York. CAFCASS, the court welfare service has been repeatedly condemned in various reports since it was established in 2001 with a brief to to safeguard and promote the welfare of children; give advice to the court about any application made to it in such proceedings and make provision for the children to be represented in such proceedings. The haste with which CAFCASS was established was, according to a House of Commons report, “a serious misjudgement”; and breached ministers’ obligations under the UN Convention on the Rights of the Child (House of Commons Committee, 2003). CAFCASS came to be “perceived as the enemy of a quality service to children” (House of Commons Committee, 2003). The 2003 DCA Select Committee report commented that “CAFCASS’ failure to establish even a minimum training and professional development strand appears to us to be one of their more serious shortcomings” (Department of Constitutional Affairs Select Committee, 2003c). Barely a single OFSTED report has found the service to be adequate and the organisation has been beset by institutional failings which have cause a huge backlog in cases and unacceptable delays to private law cases. Family Court Advisors habitually express views beyond their professional expertise; they ignore CAFCASS guidelines on report writing; they do not differentiate between evidence and opinion; reports are poorly written, badly spelt and ungrammatical, exposing a lack of basic education amongst FCAs. In 2010, NAPO the union representing many CAFCASS officers produced a press release followed by a parliamentary briefing paper claiming that CAFCASS was in meltdown, and pointing out that the head office budget had increased threefold while delays lengthened and staff morale collapsed (NAPO, 2010). In September 2012 the House of Commons Public Accounts Committee launched an enquiry into CAFCASS; in November it reported; dramatically it proclaimed CAFCASS to be “not fit for purpose”. Fathers4Justice engaged in dialogue with CAFCASS, but CAFCASS never identified the research it cited and never delivered on its commitments. On 13th March 2012, a Channel 4 News investigation found that 1 in 5 ‘expert’ court witnesses had no qualifications in their field. 65% of reports were rated poor or very poor. 90% of the experts were not in current practice. In 2004, the Family Justice System cost £435 in 2011 it cost £800 million. In 2013, many parents will be left without legal representation after government cut backs to legal aid. Closed courts mean that there is no independent audit of family court activities; no appraisal of judges, no assessment of the judgements made, of court process, of delays, or of the involvement of CAFCASS. As no records are kept, no evaluation can be made. Without evaluation what are judgments based on? No assessment is ever made of the effect of family court intervention on a child or his family. Secrecy is often excused on the grounds that children will be psychologically traumatised by media exposure, there is not a shred of empirical evidence to support this; it is based on supposition and is in Mr Justice Munby’s words, “in significant measure speculative” (Norfolk County Council v Nicola Webster and 5 Others, 2006). The suffocating secrecy of the family courts prevents transparency and scrutiny of the system and threatens parents with prison if they go public about miscarriages of justice. Secret hearings are conducted “in camera”, or “in chambers”; they are private, and open only to the parties and their legal representatives and to CAFCASS. Publication of details of proceedings is made criminal contempt by the Administration of Justice Act 1960. Section 97 of the Children Act 1989 prohibits publication of any material likely to identify a child involved in proceedings. This legislation makes identification a criminal offence rather than merely contempt. The default position of the courts is that children remain anonymous unless it can be shown to be in their interest for anonymity to be lifted. Closed courts protect adults’ prejudices, ineptitude and dishonesty and the system itself. Secrecy, excused on the grounds that it protects privacy, is the cloak beneath which privacy may be invaded without restraint. On the issue of allowing the media to attend proceedings as of right, the media were 100% in favour and the public 72% in favour; the legal profession and judiciary were respectively 78% and 73% opposed. On the issue of allowing others to attend, the media and public were 100% and 92% in favour and the judiciary 61% opposed. (Government Consultation, 2006). In April 2010 the Lords passed Part 2 of the Children, Schools and Families Bill which would extend the relaxation of reporting restrictions further, allowing journalists to report more detail and possibly to report some of the documents in cases. The new Coalition Government decided to jettison this part of the Act in 2012. On the vital issue of court openness the Family Justice Review found that “Our own work has not led us to share concerns that arbitrary or ill-founded decisions are taken” (Family Justice Review Panel, 2011b). They concluded, “we have not taken evidence on the controversial issue of public access and none of our recommendations affects, or needs to affect the openness or otherwise of the family courts”. Fathers4Justice believes child support should mean emotional and financial support of our children. However, consecutive governments have continued to portray fathers as ‘feckless’ or ‘deadbeats’ and reduced them to the status of cashpoints. The reality is that without equal rights and responsibilities for fathers, the child support system is doomed to failure even as the government prepares to replace the CSA with a new Child Maintenance Service. As the law stands, a father can abandon his children tomorrow, provided he pays. The Child Support Act 1991 was a tax on fatherhood: to impose a financial obligation on a man who has no right to a relationship with his children – to levy a tax without representation – is a gross violation of his rights. The Act was predicated on the traditional court outcome in which a child lives entirely and exclusively with his mother (the PWC), while the father (the NRP) is wholly absent and only contributes financially. Determination of which parent is cast in which role is based entirely on gender, and its effect is that the mother, who looks after the child for only 50% of the time, is deemed to have discharged her entire maintenance responsibility simply by virtue of being the “person with care”, and that her income is disregarded. The refusal to consider child support and contact together has been condemned by academic John Ermisch (Ermisch, 2006). In the light of Labour’s 2006 White Paper on child support (Department for Work and Pensions, 2006) he pointed out that if reform “is successful in improving enforcement, then it is likely to reduce the frequency of fathers’ contact with their children for many fathers”. Mothers trade contact time between non-resident fathers and their children for child support payments (Del Boca & Ribero, 1999) (Del Boca & Ribero, 2001) (Ribero & Del Boca, 2003). There are 1.1 million separated fathers currently paying maintenance to the CSA. Fathers living on state benefits will see their flat-rate payments doubled from £5 to £10. 95.2% of ‘absent’ parents are fathers, even those with shared parenting arrangements. (Child Maintenance and Enforcement Commission). CSA calculations and rules benefit incentivise ‘parents with care’ to withhold contact and minimise overnight staying contact. There is no division of benefits for fathers who share the care of their children. 73% of fathers comply with child support commitments. (CSA). 63% of fathers who don’t pay are unemployed or on income support. (Bradshaw, 1998). Only 15% of fathers who don’t pay, have a clear ability to pay. (CSA). Underlying social dynamics coupled with a taxation system that incentivises single parenting are changing the fabric of family relationships. Yet marriage remains the securest and most beneficial environment for children. As a result, taxpayers are left subsidising single parenthood and fatherless families which result in the worst outcomes for our children and country. F4J supports marriage and believes that successive governments have discriminated against married couples through the tax system with traditional families paying more tax in Britain than in any other developed country. A single-earner, married couple with two children on £35,000 have a tax burden 52 per cent higher than the average for such a family in other developed countries. The government has penalised stay at home mums by cutting child benefit from those families where one parent works and earns over £60,000 per annum. Yet if a family earns £100,000 split evenly between two earners, you keep all of the child benefit. Married couples should be able to use their transferable tax allowance by applying the tax–free allowances of both husband and wife to the salary of the working spouse. This would end discrimination against mothers who stay at home which is discrimination against families with children. If the same British family earned £26,000 a year, roughly the average salary, they would pay 85 per cent more tax than the average for such families in the Organisation for Economic Co-operation and Development. Couples who remain together until kids 16, 97% are married. Lone mothers are twice as likely as two-parent families to live in poverty at any one time (69% of lone mothers are in the bottom 40% of household income versus 34% of couples with children). (CIVITAS). 97 per cent of all couples still intact by the time a child is 15 are married. (Centre for Social Justice). Fewer than one in ten married parents have split by the time a child is five compared with more than one in three who were not married. Where parents were not living together when a child is born, the break-up rate (five years later) is a staggering 60 per cent. (Centre for Social Justice). 75 per cent of family breakdown involving children under 5 results from the separation of unmarried parents. (Centre for Social Justice). Britain has the highest rate of young offending in Western Europe. 1 in 4 teenagers has a criminal record with more children locked up in British jails than any other European county. 56% of young offenders are convicted again within a year. The cost of young offending is over £11 billion every year. Despite being the largest equal parenting campaign group in the world consecutive governments have chosen to exclude Fathers4Justice from the democratic process and deny the 35,000 families we represent a voice in government. This lack of representation is an affront to democracy and fundamentally undermines the legitimacy of the reform process. A poll conducted for the Conservative Party in 2011 found that Fathers4Justice was the British public’s third highest supported campaign group with 63% approval, behind Greenpeace on 69% and Amnesty International on 68%. Support was surprisingly consistent across different groups with support from women only slightly lower than support from men and support from Guardian readers only slightly lower than from Mail and Telegraph readers. Opposition to our campaign was relatively low at 15% compared with 17% for Greenpeace or 23% for the Countryside Alliance. Fathers4Justice represent 36,000 registered families and are the world’s largest equal parenting group. Despite this, Fathers4Justice have been denied any representation on any government group or working party looking at family law reform since our inception in 2001. It is unthinkable that such an overwhelming constituency of people could be denied representation if they belonged to any other group in society. A Ministerial Working Party set up to consider these reforms was neither gender balanced or representative. It comprised of nine women and just two men. How can the government reach an informed judgment without the testimony of a single parent who has lost their children in secret courts? Historically F4J has repeatedly been denied the opportunity to give any oral testimony to MP’s. In 2004 when the Parliamentary Select Committee on Family Law were considering the matter, Sir Alan Beith (the chairman of this committee), refused to give Fathers4Justice the opportunity to give oral testimony on this matter. Sir Bob Geldof also refused to participate at that hearing. He said that if we were not invited to give oral testimony, the committee could command no respect or legitimacy as it was denying a voice to the largest constituency of parentsaffected by decisions made in secret family courts. In 2011 we submitted a 1200 page forensic analysis of the failings of the Family Justice system to the Norgrove enquiry which was totally disregarded. Norgrove concluded that the operations of the family courts were generally acceptable and that not only did fathers have no rights, but that they deserved no rights. Firstly the government did not need a report to tell it what it already knew and what it had promised to change in pre-election promises made to Fathers4Justice in 2010. However, the government reneged on those promises and demonstrated a fundamental lack of moral courage confirming what Ian Duncan-Smith had told F4J in 2010, that it was ‘political suicide’ for anyone to take this issue on in Parliament. In June 2012, the government offered four different approaches to ‘strengthen shared parenting’ by amending section 1 of the Children Act 1989 in order to meet the Government’s objectives set out in paragraphs 4.1 to 4.6.The Government’s feeble cocktail of proposals is a charter for conflict and fatherlessness. Even after 10 years of campaigning, fathers have been deemed so unimportant to children to even merit a single line in a statute assuring their full participation in the lives of their children post-divorce or separation. A Bill which cannot even mention the word ‘father’ has no serious value or meaning. Option 1 – Requires the court to work on the presumption that a child’s welfare is likely to be furthered through safe involvement with both parents – unless the evidence shows this not to be safe or in the child’s best interests. Option 3 has the effect of a presumption by providing that the court’s starting point in making decisions about children’s care is that a child’s welfare is likely to be furthered through involvement with both parents. They fall far short of those proposed by the Conservative Party in response to the Green Paper of 2004 and breach the Conservative Party’s pre-election promises made to Fathers4Justice in 2010. The Government refuses even to consider the allocation of parenting time after separation, despite the fact that most family court disputes are about the allocation of parenting time. They retain the offensive presumption that a father represents a potential threat to his children while a mother does not. They will mean nothing without robust enforcement of contact orders. They will do nothing to reduce the likelihood of further litigation. They embody no right in law for parents to see their children. They embody no right in law for grandparents to see their grandchildren. They offer no definition of a “meaningful relationship” between parent and child. There is no concomitant commitment to reform the family justice system, end secret courts and replace them with an open, transparent and accountable system of justice. There is no concomitant reform of the Child Support Agency to ensure both parents are treated equally in the eyes of the law and that benefits are divided equally according to the division of parenting time. They retain the language of gender apartheid and institutionalised discrimination.